I've been doing some photo editing this week, and you probably know that if you've been up on reading our posts. I take normal photos of my pets and turn them into something more crazy and Christmasy. I'm happy with this zany piece of work. Thanks to PicMonkey for their easy, user-friendly editing site! I use it for basically everything. Believe it or not, it only took me about thirty seconds to touch up this hilarious photo. 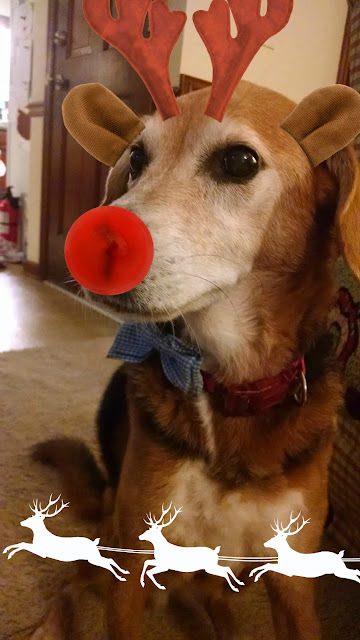 Take a look at how awesome editing is with Katie the red nosed Beagle! I used Picmonkey, which is a very simple, user-friendly website (not a program) that helps you edit your photos quickly and easily.